The Astrotec AM850 is a new competitively priced ultra-wide bandwidth single dynamic IEM. They use a 10mm single diaphragm driver to cover a large spectrum of the frequency response. Despite the sub-100 $ price, the build features metal housing with wood elements and a durable PU reinforced cable. Astrotec tops it off with a generous supply of accessories. Let’s see how it fares within an oversaturated market. They are available on AliExpress and Amazon. The AM850 come nicely packaged and it is always great to see when a budget-tier IEM looks fancier than a more than thousand dollar flagship. 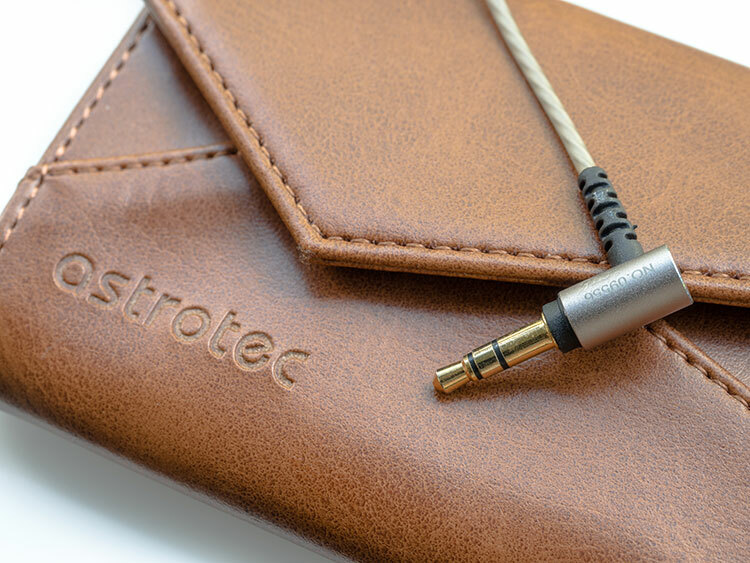 Astrotec uses a very durable carton with a nice overlaid paper with a rough texture that contrasts a reflective design of the packaged in-ears with the company logo. Magnets hold the foldable wings in place. 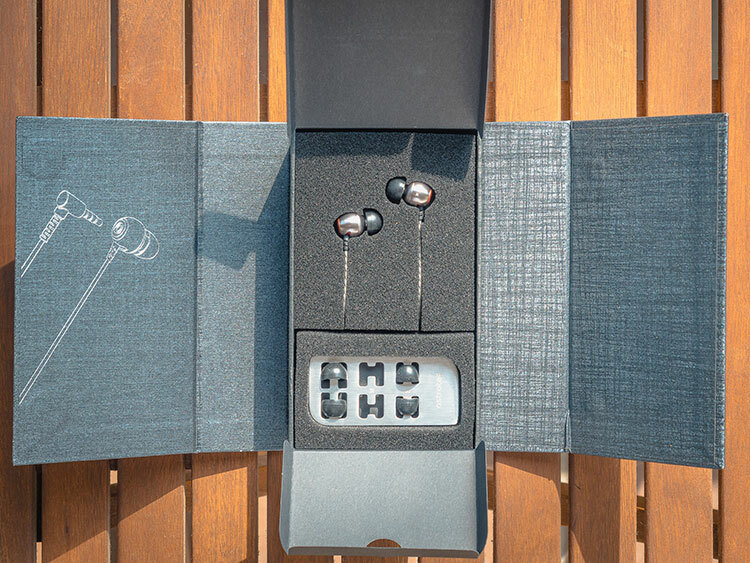 Opening the box will reveal the earphones which are presented in cut-out foam. The AM850 are a joy to unpack and the unboxing raises expectations in performance. 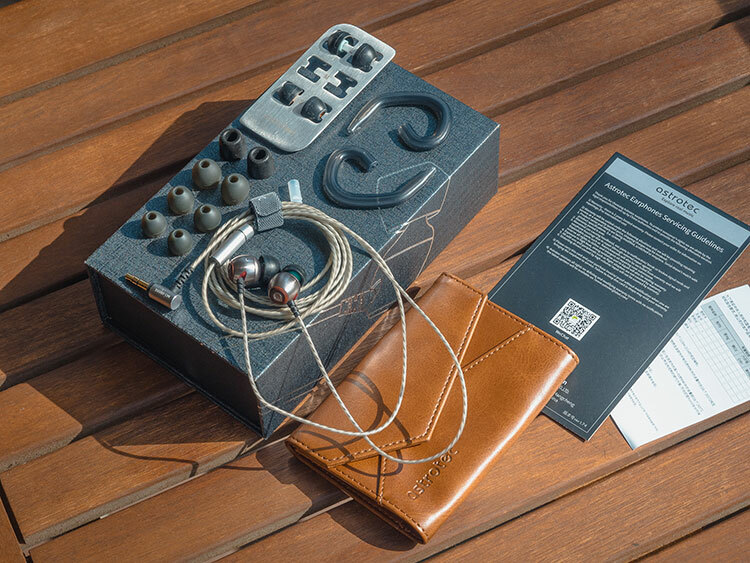 The complete package includes an abundance of ear tips, cable hooks, an airplane adapter, a velcro band and a flat leather pouch. 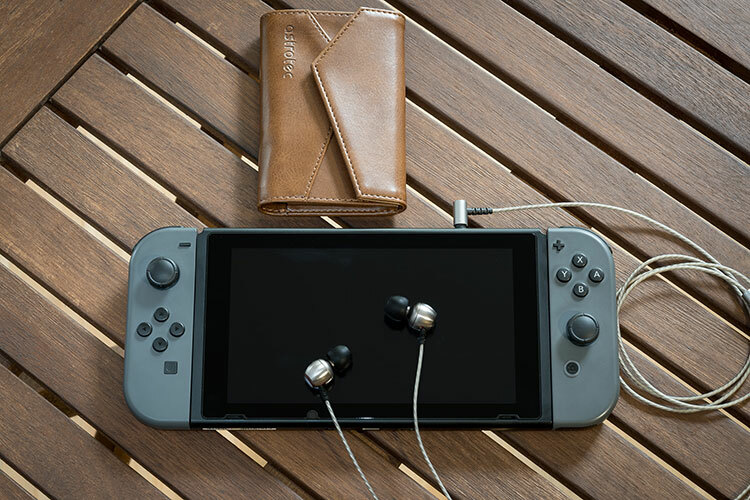 The pouch looks nice but it won’t protect the earphones if you accidentally sit on it. I actually like the case for storing accessories a lot. The cable guides can make it easier to wear the cable over the ears, but it’s not really necessary to use them as they also add some bulk and make it easier for the cable to get tangled. Astrotec offers a wide selection of tips, which is always nice to have. There are two distinct styles among them, with one being packaged and pre-installed. It seems to be the premium and recommended ear tips. Visually they resemble SpinFits because of their colored stem, but they are actually quite different. The premium tips, as I call them, have a very soft and sticky rubber. The tips are very comfortable and they have a short stem which allows deep insertion. I like these a lot for many earphones except the AM850 for which they are intended. The reason being, that the rather big housing of the IEMs does not allow a very deep fit. The other tips are decent enough, so all is dandy. There is also one pair of foamies added, though only in size M whereas the other tips are available in 3 sizes each. 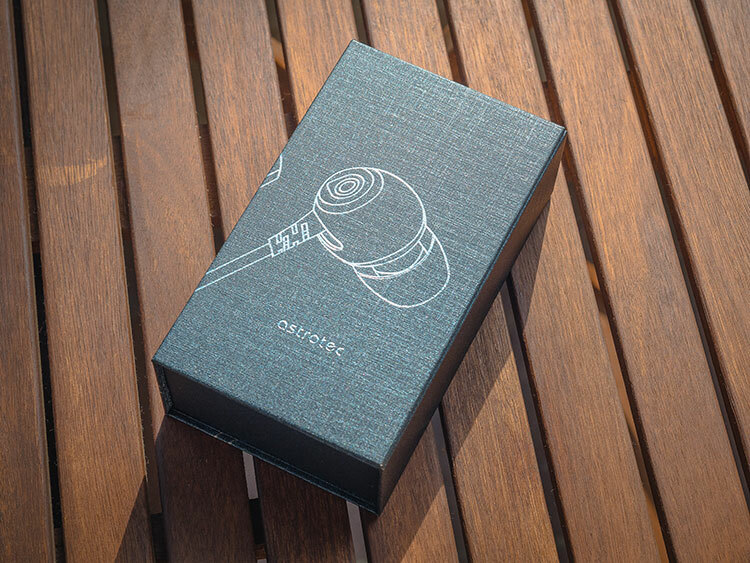 The 10mm dynamic driver is placed inside a round metal sphere put together from two pieces. 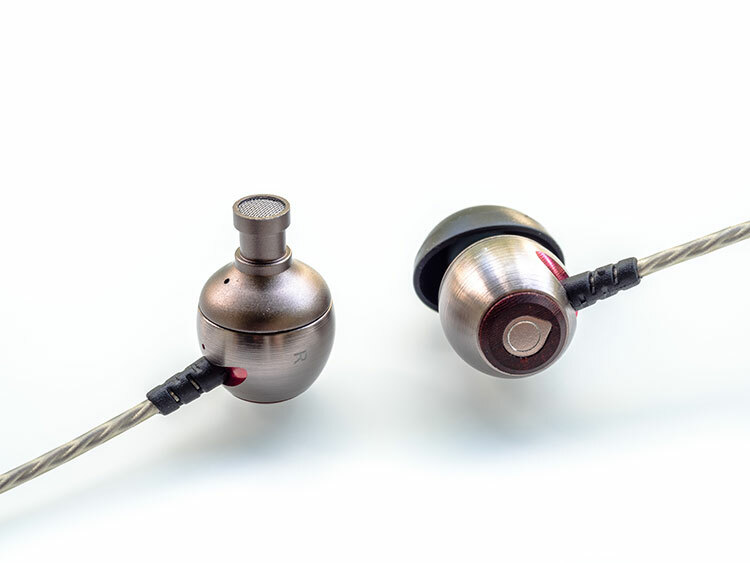 The back of the IEM has a circular santal wood detail with an inside metal plate that vaguely resembles a teardrop. This is a missed opportunity because the shape should have been the company’s logo. On the bottom, where the cable is connected, there is a pink colored notch that puzzles me. The wood piece on its own would have looked high quality and would match the leather pouch well, but the pink notch feels somewhat out of place. I can’t figure out any reason for it either. As long as you don’t need deep insertion, I can see no reason how the AM850 could cause discomfort. The big round body makes it a bit more difficult to achieve a good seal with shorter tips but I had no problems to find the right size and shape to wear them comfortably with some of the included more standard tips. You can wear the IEMs with the cable down or over the ear as the inclusion of ear guides suggests. The all-metal housing with wood details should promise a good build. I like how the nozzle is not a separate part of the metal body. It is also equipped with a metal mesh to keep dirt out. Also, the Y-split and the slider are made from metal. This IEM looks very durable. 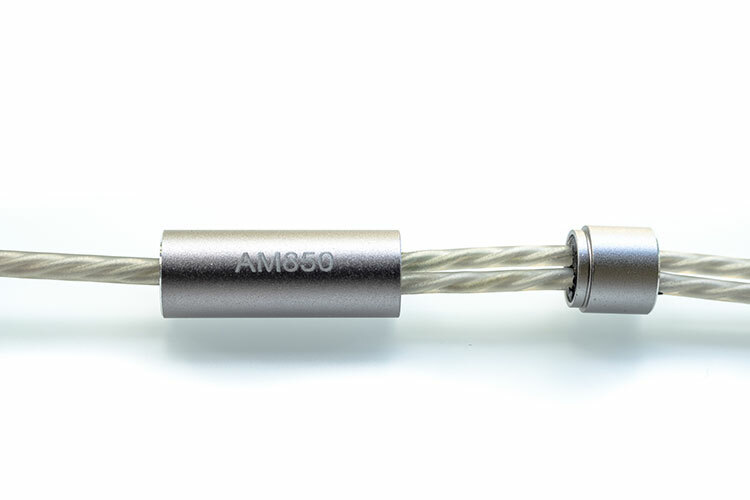 The cable is silver-plated and PU reinforced. Sadly it’s not user-exchangeable but I have no fear that it should break. The strain relief on both sides is solid and feels stable. However, the cable is a bit flimsy and has strong memory. I have issues fully straightening it out. I like the right-angle connector for a higher portability. The AM850 are tuned in a way that clearly boosts the low end. There is a strong and forward bass that covers a lot of the great mid and treble fine-tuning. The bass doesn’t cover up too many details, but it is enough to easily topple the other frequencies into a warm signature. I will start this one differently and begin with the highs and discuss the lows at the end. For me, the treble is an underrated achievement with the AM850. The treble is smooth without any sibilance. There are no apparent dips or peaks that I noticed. There is slightly lower pressure around 8kHz that slowly rises to 10k, yet it is perceived mostly flat. This helps with very high resolution and great details. Never have I felt like the treble was too forward or even hot. Sibilant tracks are no problem for the AM850, yet it manages to pick up small details. Furthermore, the treble extension is decent. The performance here punches far above the suggested retail price! The midrange is mostly in-line with my perception of the treble. I think it is fantastically tuned with great realism and just a little added warmth in the lower midrange. The tonality of female vocals is spot-on and recorded voices sound very similar to my reference setup. The accurate tuning helps again with a high resolution. I recommend listening to the intro of Florence + The Machine’s What Kind of Man. The first 30 seconds are sung by two voices – have you noticed the male in the background saying the same words? Chances are you have missed it, but you wouldn’t have with the AM850. Male voices are slightly colored by the bass and sound a bit warmer than female voices, but overall this is still a very great tuning. While mids and highs wouldn’t make you believe the AM850 was a budget-tier IEM, sadly, the lows do so. Astrotec opted for a very deep and dark bass, one that achieves great extension for the cost of added fullness. The small AM850 create very strong rumble and equally strong punch. 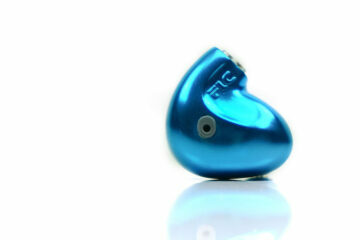 I wish I could just say that this is a basshead IEM, but I think some bassheads might ask for better resolution. The note decay is obviously hurt by such strong lows and I was wishing for a better timbre of drums and a more refined shape of the instruments. Where it didn’t bother me, was with EDM. It’s really hard to judge the timbre with electronic music and I did enjoy the physical vibration of the bass when a track was aiming for it. However, if you have access to an equalizer – and almost every device does, nowadays – I suggest lowering the bass broadly by 5 dB. Even the most simplistic 10-band EQ will do. I promise you will be amazed by the much-improved resolution! I wish the AM850 would sound this way by default. The strong low-end helps in creating a deep soundstage. However, at the same time, the bass is also quite forward and it creates intimacy. I felt mostly like I was in a venue I frequented 10-15 years ago. Imagine a low-ceiling underground metal band performing in front of 200 people and you being right there in the mosh pit behind the front row of headbangers. That’s the most vivid description I can give you. It’s not going to win awards in the overall size of dimensions and imaging is not up to the precision of multi-BA designs, but overall it is a lot of fun and that’s what matters most. Not only are the Astrotec AM850 easy to drive, but they are also very stable across all frequencies no matter the output impedance of the source – even more so than the FIBAE technology from CustomArt, for example. Of course, this is easier to achieve with a single dynamic driver, but it is also great to know. For once, you do not have to worry about plugging your IEMs into a half-heartedly developed headphone output of a speaker amp. Even 300 ohms OI can’t bend the frequency response. The AM850 aren’t even prone to hiss, however, you will notice it if the amp is a very poor match for sensitive headphones. There is no particular match that I could recommend. Any smartphone should work very well with the AM850 and provide enough headroom. If you have a particularly spacious amp, the AM850 might be able to improve in the soundstage. However, as suggested before, I do recommend to implement an EQ somewhere in the audio chain, even if it is just for comparison’s sake. The 1More Triple-Driver costs almost the same as the Astrotec AM850. The packaging is even quite a bit fancier and the accessories even top those included by Astrotec. Build quality is comparable and design is quite the subjective choice. But what matters most is the sound. At first listen, the AM850 are quite a bit warmer and darker sounding. The bass weight is stronger with the Astrotec but after extended listening, they will start to sound more cohesive. The midrange feels more homogenous and the treble more realistic. Both IEMs have a smooth presentation but the AM850 sound more liquid and complete. The Triple-Driver’s upper treble peak disjoints the presentation a bit and this is where the AM850 shine most. I prefer the bass detail of the 1More but mids and highs of the Astrotec. There are some differences between the Final E3000 and Astrotec AM850, however, their tonality is quite comparable. The AM850 are even bassier, but midrange and highs are almost equal. The E3000 has the disadvantage of a vented back and thus greatly limited isolation. This can be bothersome in most situations but it can also help to compensate for the warm tonality. I prefer the better isolation of the AM850 and simply using an EQ to tame the low-end a bit. Midrange and treble accuracy is very good with both monitors and it’s also a tie for soundstage, IMO. The thing to consider is that the Final is quite a bit cheaper and their ear tips are among the best available at the moment. I also like Final’s stock cable a bit more as it is more flexible and softer. However, the AM850 seems to be more durable and might be the better investment in the long run.